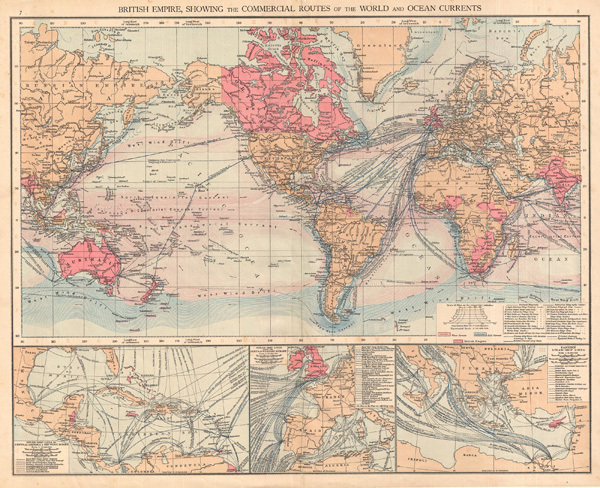 This beautiful colored map of the British Empire in 1895 show the commercial routes of the world and ocean currents. Includes three insets detailing steamship lines in 1) Central America & the West Indies, 2)Western Europe, and 3) the eastern Mediterranean. Areas under British control are highlighted in Red These include Australia, Belize, parts of Africa, Cyprus, India, New Zealand, parts of Borneo and New Guinea, and the British Island themselves. Published for the London Times by Cassell and Co. as plate no. 8 in the 1895 Times Atlas of the World. Andree, R., The Times Atlas of the World, (London) 1895. Rumsey 1010.005. Espenhorst, J., Petermann's Planet, v. 1 p. 610-613.